TAE684 (NVP-TAE684) is a potent and selective ALK inhibitor with IC50 of 3 nM in a cell-free assay, 100-fold more sensitive for ALK than InsR. (A) H3122 xenografts harboring the EML4-ALK translocation were treated with control vehicle or the ALK inhibitor, TAE-684, for 2 days; the tumors were excised and lysates were prepared. The TIMM results for the control and treated animals are shown. (B) H3122 cells were treated in the presence or absence of TAE-684 (100 nM) for 6 hours in the presence or absence of the indicated ligands [EGF (50 ng/mL), IGF1 (50 ng/mL), and HGF (50 ng/mL)]. Extracts were probed with the indicated antibodies. Ceritinib (LDK378) is potent inhibitor against ALK with IC50 of 0.2 nM in cell-free assays, shows 40- and 35-fold selectivity against IGF-1R and InsR, respectively. Phase 3. Quantitation of crystal violet uptake by ORF-expressing cells exposed to crizotinib (CRZ) or ceritinib (CER) normalized to Lac Z. Mean and SE are shown for six (CRZ) or four (CER) independent experiments of three replicates each. AP26113-analog (ALK-IN-1) is an analog of AP26113 which is a potent and selective ALK inhibitor. It is also an inhibitor of EGFR. Several ALK inhibitors effectively inhibit the growth of CD74–ROS1–addicted Ba/F3 cells. A, Ba/F3 cells expressing CD74–ROS1 (clone #6) were seeded in 96-well plates and treated with the indicated concentration of crizotinib, ceritinib, AP26113, ASP3026, or alectinib for 72 hours. Cell viability was analyzed using the CellTiter-Glo Assay. B, IC50 values (nmol/L) of Ba/F3 cell lines expressing CD74–ROS1 (clone #6) against various ALK inhibitors are shown. Average IC50 values against crizotinib, ceritinib, or AP26113 were calculated from the three independent experiments. IC50 values against ASP3026 and alectinib were calculated from the single experiment. C, inhibition of phospho-ROS1 by various ALK inhibitors in Ba/F3 models. CD74–ROS1–expressing Ba/F3 cells were exposed to increasing concentrations of crizotinib, ceritinib, AP26113, ASP3026, or alectinib for 3 hours. Cell lysates were immunoblotted to detect the indicated proteins. Protective effect of IGF1 on Sorafenib or VK1-mediated actin cytoskeleton redistribution in HCC cells. PLC/PRF/5 and HLF cells were stained with DyLight 554 Phalloidin after treatment with 1 μM Sorafenib, 12 μM VK1 or 1 μM GSK1838705A (GSK) for 24 h alone or in combination with 40 ng/ml IGF1. Scale bar: 100 μm. TP0427736 is a potent inhibitor of ALK5 kinase activity with an IC50 of 2.72 nM and this effect is 300-fold higher than the inhibitory effect on ALK3 (IC50 = 836 nM for ALK3). It also inhibits Smad2/3 phosphorylation in A549 cells induced by TGF-β1 with an IC50 value of 8.68 nM. (E) Immunoblot analysis of lysates of A4573 and TC32 cells following exposure to media only (Control, C); ST/V and V/ST with (+) or without (-) 20 nM AZD3463 using antibodies against ALK, IGF-1R, STAT3 (Y705), p-STAT3, AKT, p-AKT (S473), MAPK, p-MAPK (p42/44). ASP3026 is a novel and selective inhibitor for ALK with IC50 of 3.5 nM. Phase 1. Tumor cells were treated with entrectinib (10 nmol/L) for 4 hours or c-PARP for 48 hours, and harvested lysates were assessed by Western blotting. Data shown are representative of three independent experiments with similar results. TPX-0005 is a novel ALK/ROS1/TRK inhibitor with the IC50 values of 1.01 nM for WT ALK, 1.26 nM for ALK(G1202R), and 1.08 nM for ALK(L1196M); also a potent SRC inhibitor (IC50 5.3 nM). Immunoblotting analysis of H3122 and H3122-CER cells showing that brigatinib did not inhibit EGFR phosphorylation (p-EGFR). Total EGFR (t-EGFR) is also shown. Actin was used as a loading control. The cells were treated with brigatinib for 2 hours. 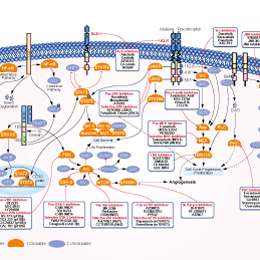 "Belizatinib (TSR-011) is a potent inhibitor of ALK (IC50=0.7 nM) and tropomyosin receptor kinase (TRK) (IC50 values less than 3 nM for TRK A, B, and C). " Ensartinib (X-396) is a novel, potent and specific ALK TKI with the IC50 less than 4 nM in Ambit assays.